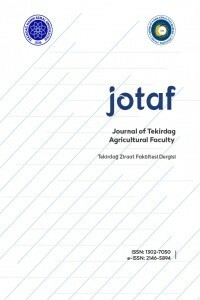 Journal of Tekirdag Agricultural Faculty (JOTAF) is an international peer-reviewed journal publishing at least three issues a year (January, May and September). The jounal of Tekirdag Agricultural Faculty publishes new and original researhes in the field of agricultural economics, agricultural machinery, irrigation and drainage, animal sciences, food engineering, field crops, horticulture, plant protection, biosystem engineering and soil science are considered for publishing as hard copy and electronic copy. The papers are published in English and Turkish languages. It is not permissible for author(s) to the JOTAF and other journal(s) manuscrşpts submitted to JOTAF should not have been previously published or submitted to any other journal(s). Plagiarism in any form will not be tolerated. Each paper is presented to the referees recommended by the editorial board. Publication fee is 80 Euro for every single accepted article, after first Issue of May 2018.